Our new hunting pricelist has been published for the upcoming season. Please note that we provide -10% discount from teh Kisszékely red stag prices (only from the Kisszékely stags)! Gyulaj Zrt's new image-film has just finished. It has been made with love and passion for our partners and clients. Thank you for posting and sharing it! Even the fallow buck rut is still going on both on our fallow deer areas (in Gyulaj and Kisszékely) we can already provide some very nice photos from this season's quarries. Most of the bucks in the pictures are more than 4kg (24hrs trophy weight), the one with the wild boar is around 5kg. Great season we have so far! Even the weather was nearly as hot as in summer during almost the whole rut season, now - at the end of it- we can say; this year's red stag season brought nice results at Gyulaj Hunting Hungary's hunting grounds. The three hunting areas where we have nice red deer populations provide us nearly 45 trophies altogether only in the rut, in September month. Eight stags' trophy weight were weighed over the magical 10kgs. This year the heaviest trophy weight was 10.81kg, reaching 216.11 IP point at the scoring. 5 stag trophies received CIC golden medal, 15 of them received CIC silver medal and 12 bronz medal. We had very nice hunting clients from all over the world: USA, Germany, Austria, Norway, Italy, etc. Congratulations for all our clients and our professional staff for the nice results! Gyulaj Hunting Hungary had a great opportunity to representative its own legendary hunting grounds in the Danish hunting fair, called "Jagt&Outdoor 2018" in Odense, Denmark between March 22nd and 25th, 2018. This show is the most important hunting fair in Denmark, it's being kept every second year. Three different halls were used for three different branches; guns,clothes,optics&accessories, hunting trips&safaris and dogs. Our Danish partner's- the Gamekeeper Hunting Tours A/S' booth was very popular among the visitors. Many of the hunters were interested huntings in Hungary, so Gyulaj's representatives had some busy days and hours during the show. Our most captivating experience was to see the families, including many children and women huntresses visiting this special fair. We truly hope that our presence help the Danish and Scandinavian hunters to decide to choose Hungary and Gyulaj as one of their next destionations. The new, 2018/2019 hunting pricelist of Gyulaj Zrt. is published now. We think the new design look great, using our own or clients' photos, which we are very thankful. Please click on the picture below to see or download the PDF document. Great red stag season at Gyulaj Zrt. We had a great red stag season this year. The number and the quality of the shot stags' trophies are breaking records of the past decades. 51 red stags were shot so far and the average trophy weight of the was 8.08 kg. The heaviest trophy was 13.14kg shot by a Swedish client, the second heaviest was 12.48kg from Bikács-Kistápé. The heaviest Hőgyész stag was 11.40kg this year. The world class 13.14kg stag received 241,62 CIC point and gold medal of course. Gyulaj Forestry and Hunting Plc (~Gyulaj Hunting Hungary, Gyulaj Erdészeti és Vadászati Zrt. in Hungarian) was awarded with the Edmond Blanc Prize by the CIC at the 64th CIC General Assembly in Montreux, Switzerland. It is a privilége for us to have this amazing award, which we very proud of. CIC (Conseil International de la Chasse et de la Conservation du Gibier or the International Council for Game and Wildlife Conservation in English) as one of the most important NGOs related to hunting, wildlife conservation and management held its 64th General Assembly between April 27 and 29, 2017. CIC has been awarding the best hunting grounds and wildlife reserves of the world since 1928, choosing one area each year honoring the area’s professional efforts and management with the organization’s so called Edmond Blanc Prize. More precisely; „the Prize shall be awarded to game reserves, conservation associations and organisations that work with wildlife protection and conservation and game management in different countries. Only those game reserves and game organisations that have had outstanding success in their work to conserve the natural environment, to protect free-roaming animals in the wild and to manage game according to principles of sustainability shall be eligible for Edmond Blanc Prize.” In 2017 this award went to the Gyulaj Forestry and Hunting Plc. (~Gyulaj Hunting Hungary), which made many Hungarian hunters very proud. This year’s venue of the General Assembly was Montreux’s beautiful Fairmont Hotel Palace***** by the bay of the breathtaking Lake Geneva in Switzerland. The luxury buildings and the mesmerizing surrounding landscape provided even more lofty athmosphere to the professionally organized assembly and its ceremonies. The three days assembly dealt with very important and relevant topics such as the ASVF- problem (African swine virus), the increasing presence of wildlife in urbanized areas or the harmful „green lobby” with its disinformations and lies. The awarding ceremony took place last day of the assembly in the venue’s elegant conference hall. By the decision of the CIC Prize Comittee Gyulaj Plc. won this prestigious award because of its well known Gyulaj Hunting Ground, its legendary fallow deer management, deep and outstanding hunting- historical background, one of the best populations of fallow deer of the world (besides the 5 CIC world record fallow buck trophies given to the world by this area) and its ’70s and ’80s worldwide game-export project to introduce the famous Gyulaj-fallow deer to many hunting grounds of the world (such as Hungary, UK, Austria, Bulgaria, Czech-Slovakia, France, Poland, Russia, Sweden, Germany and so on). During the ceremony the professionally set up presentation to introduce Gyulaj’s nomination was held by Mr. Baron Wulf Gordian Hauser (President of CIC Prize Comittee), the award was personally given by Mr. George Aman (President of CIC) to Mr. Péter Gőbölös (CEO of Gyulaj Plc.). The Hungarian delegation included Mr. Tamás Marghescu (General Director of CIC), Dr. Kristóf Hecker (Head of Division Coordinate Unit of CIC), Prof. Dr. h.c. Dr. Sándor Faragó (vice-chancellor of Sopron University, Hungary) and Mr. Tamás Kovács (Deputy Head of Wildlife Management, Gyulaj Plc.). Gyulaj Forestry and Hunting Plc (~Gyulaj Hunting Hungary) kindly informs all partners that Mr. Csaba Gálos has left our company. Since March 16, 2017 the new Head of Wildlife Management is Mr. Szabolcs Szeifer. Please note that Mr. Gálos' mobilenumber and e-mail address is suspended, not available any more. Gyulaj Zrt (Gyulaj Hunting Hungary) is very proud that Kisszékely village became the 4th most beautifully located village of Hungary according to the Origo's online voting competition. By the readers' votes the most beautifully located Hungarian village is Súr (North-West Hungary), followed by Császártöltés (South Hungary), Feked and Kisszékely in South-West Hungary. The 4th placed Kisszékely received only a few hundred votes less than the second and third place village. Gyulaj Hunting Hungary has its own hunting lodge and the famous Kisszékely Hunting Ground with its beautiful approx. 6.500 hectares hunting ground around the small village. Congratulations for the beloved Kisszékely and hope more and more hunting clients will enjoy the beautiness of the natural environment and the location of the village! From October 1 we have busy days on our Gyulaj and Kisszékely Hunting Grounds. Better and better bucks are harvested by our international and domestic clients. The rut is amazing, providing unforgetable memories for both our clients and professional staff. This amazingly nice was filmed on Gyulaj Hunting Hungary's famous Hőgyész hunting ground in the September rut season. It clearly seems that the old, huge monster stag rules the area and all red deers around on his place. Whatch this! Please watch our new red stag videos from Gyulaj Hunting Hungary's YouTube hunting channel. Roaring stag from our Hőgyész Hunting Area in South-West Hungary. Beautiful scene. Gyulaj Hunting Hungary is now launched the new, 24 hours streaming live webcam. Our goal is to show the hidden and unique wildlife of our legendary, Gyulaj hunting ground. The camera is put into a valley next to a grazing field, so the game and wildlife enthusiasts can follow the happenings of the local wildlife 24 hours from any places of the world. Don't worry, you can't miss a thing as we save all interetsting happening and upload it to our YouTube channel, so everybody can look back in time to see what trophy size fallow buck or wild boar, fox or even golden jackal appeared. A great, short image-film was published to introduce the local and nearby treasures including the legendary wildlife managed by Gyulaj Hunting Hungary. The wildlife and outdoor footages were filmed in Gyulaj Huting Ground of GyHH. We are proud of our beautiful and great wildlife! To enlarge the picture below, please click on it! On last day of September we have the opportunity to look back this year's red stag rut season. In nutshells Gyulaj Hunting Hungary can say; this September both the rut and hunts were great. The harvested stags dimensions and datas speak of themselves: In our Hőgyész Hunting ground the harvested September 30 stags average trophy weight was 8,.03kg. From this 30 stags 3 were over 10kg. 97% won CIC medals (4 golden, 12 silver and 13 bronze). In our Bikács- Kistápé Hunting Ground the rate of the medal-receiver stags was 90% (2 golden, 5 silver and 2 bronze). The heaviest antler stags was also shot here. It weighed 11,34kg (24hrs weight) on the scale. The client- nationality was also really diverse. Many clients chosed Gyulaj for shooting stags from many different countries of the world: Germany, USA, Denmark, Austria, Slovakia, Hungary, etc. Gyulaj Hunting Hungary announces online auction of the local "DeerParade 2015" artworks. Please click on the different pictures to see the artworks' gallery. To bid for the deers by e-mail please click on the "Submit bid" below your favourite deer and give your maximum bid. We will reply you back in an e-mail as confirmation of your bid. The system shows the highest bids only. The winners are the highest bid provider persons. To see the picture gallery of "DeerParade 2015" artworks please click on this link! Gyulaj's muzzleloader project is getting more popular among the international and Hungarian hunters and muzzleloader enthusiasts.To show the unique athomsphere and excitements of hunting with a muzzleloader rifle, Mr. Balázs Németh films as much hunts as possible. Here is another great short film of a winter female fallow deer spot&stalk hunt with a Pedersoli rifle. The beautiful environment and the athmosphere of the Óbiród Hunting Lodge inspired a Hungarian filming crew to fly around the lodge and the valley with a drone last autumn. The video speaks for itself. Gyulaj Hunting Hungary Wishes You all a Happy Easter! We are always proud if a foreign newspaper publishes an article about Gyulaj Hunting Hungary. But we are even more proud if the article is about our beloved handicap hunting project. The latest article published in a Bayerischen, German newspaper's (The Münchner Merkur) online edition, the Merkur-Online.de. WARNING! Fake online hunting adverts using the name of Gyulaj! Unfortunately we have to inform You that fake and false hunting adverts are spread on the web using the brandname, logo, photos and datas belonging to Gyulaj Hunting Hungary (Gyulaj Forestry and Hunting Plc.). The online cheater(s) is using different hunting websites and blogs to spread the fake adverts, offering driven hunts as "cancellation hunt" in Gyulaj, Hungary. We inform You that we do NOT have any cancellation hunts or any kind of partnerships with this (probably fake) names; Cosmin Rusu, Zoltan Andrasi, etc. Please do not pay any deposits to unknown hunting agencies/outfitters offering Gyulaj hunts!!! Please always make sure that your hunting trips are organized by Gyulaj partners or directly by Gyulaj Hunting Hungary! If you have any questions according to hunting trips, discovered any fake or strange hunting adverts related to Gyulaj, please contact us or always ask details from our official hunting partner agencies and outfitters. DO NOT TRUST ANY UNKOWN AGENCIES, make your hunting trips organized by the most secure way, through Gyulaj directly! Thank you! The Pedersoli muzzleloader guns are the icons of the European traditional firearm industry. The company itself has a more than 150 years history and experience of making fine black powder guns. There was no doubt about the Pedersoli guns will do their job nice and easy in the legendary Gyulaj hunting ground...especially if the hunters will be the members of Pedersoli family. As we have posted the breaking news already, Gyulaj Plc's hunting ground became the only one hunting area within Hungary where traditional hunting with muzzleloader guns can be practiced. After a succesful autumn fallow buck hunt, the Hungarian muzzleloader team returned back to bag a few winter fallow does and fawns too. Please read the arcticle in English at the Hungarian website of historical firearm fans. After each main hunting season must be a day when the professional staff members can see what they worked for and see the nicest and best trophies bagged on the days behind. The annual fallow buck trophy exhibition of 2014 was held at Gyulaj Hunting Hungary's Óbiród Hunting Lodges on November 5. This year fallow buck rut was truly amazing, the statistics of the trophies speak for themselves. On the exhibition 65 bucks were displayed from the total 90 bucks were shot this year so far. 66% of the bucks received CIC medal. 30% received CIC gold medalion, 18% received CIC silver and 18% received CIC bronze medalion. So far the heaviest fallow buck trophy was 5,26kg and the most score was 215,85 IP received by another buck (with 5,01kg trophy weight). Four bucks had more than 5kg and 25 bucks were more than 4kg trophy weight. Thank you for all our clients and outfitter partners for this beautiful rut season. Even though the hunting with muzzleloaders has a big tradition in the USA, the hunters couldn't really practice their beloved way of hunting for example in Europe. Now -with a special permission- Gyulaj Hunting Hungary could be the first place within Hungary where the muzzleloaders can be used for hunting for trophy games. The first hunt with a muzzleloader gun wIthin a century happened on October 21, 2014. The lucky Hungarian client bagged a beautiful rutting fallow buck with its 170 years old German muzzleloader. Manufacturer: Miller Fa Baader und Sohn in München (Germany). Made in between 1840-1850. Caliber: 0,58" (14,7 mm), Bullet: 20,15 g, pure lead. Another giant antlered fallow buck was bagged on Gyulaj Hunting Hungary's legendary Gyulaj Hunting Ground. The beautiful quarry was bagged by a lucky Hungarian hunting client. The monster is estimated at least 10yrs old and 5kg trophy weight minimum. How is the hunting with Gyulaj Hunting Hungary? We can tell many nice words about ourself but the best way to hear oppinions is when the clients tell their own experiences in an interview. One of the Hungarian TV channels' hunting magazine made a telephone interview with Mr. Alain Durand, Deputy President of the National Hunting Association of France who has been hunt with us in Gyulaj, Hungary. A new short movie is now available on Gyulaj Hunting Hungary's YouTube channel. The short movie is introducing our business sections and activities, including forest management, hunting and game management, recreational and tourist places as well as park forest and wildlife park management. We hope You enjoy the film and get a little taste of Gyulaj Hunting Hungary! One of the Hungarian TV channels' hunting show crew visited our Gyulaj hunting ground to film the legendary fallow rut in its primetime. This short, ~3 minutes compilation shows how the famous Gyulaj rut goes on. A great compilation from a great hunting ground. A 5 pages article was published in the SCI's (Safari Club International) Safari Magazine about the five main state owned Hungarian hunting estates. The author was Dr. Gerald Warnock, a Weatherby Award winner hunter, telling a detailed story of his personal Hungarian experiences. He was the lucky one winning the auction at SCI's annual convention in 2010, Reno, NV. He bagged all the "Hungarian Big Five" in five different areas of Hungary; some nice roe bucks, a red stag, a fallow buck, a moufflon ram and a SCI world record wild boar tusker on Gyulaj Hunting Hungary Hőgyész hunting ground. This issue of the magazine was published in more than 50.000 copies and sent out worldwide from SCI's Arizona and Washington DC headquarters. Worth to read to know more about the Hungarian hunting tradition, famous hospitality, the quality of our hunting lodges and the high numbers of beautiful trophy big games we have. To read the article, please click on the picture below! Gyulaj Hunting Hungary is on Twitter now! From now on you can follow us on Twitter too! We tweet to keep you updated about the news, hunitng results and trophies of Gyulaj's well known hunting grounds. Follow us on Twitter too! It is only a few of the dozens of nice stags taken in the '013 red stag season so far. Gyulaj Hunting Hungary's South-Western Hungarian hunting grounds are more than good for red stag stalking. Let the pictures speak for themselves! Of course we were really looking forward what the next September would brings. A bit later than the previous year but he showed up at exactly the same place. He was even more powerful so our expectations and hopes grew even bigger. We hadn't seen a stag with such a huge trophy before on our hunting grounds. In that year Eugen shunned the fights and rut in the background. But the beautiful game was still too young to be bagged, even if many foreign and Hungarian hunters wanted to get him. For that winter he moved back his previous winter place. Those year’s shed antlers were found in the same area as before. The following September we awaited Eugen to get back to his private rutting place but he didn’t come. And just as things go in this kind of situations rumors began to spread: „someone has seen him here and others have seen him there”, we even heard rumors that he was shot by different local hunters, but reliable news didn’t arrive. Until February. After a driven hunt close to Eugen’s rutting place our pro. hunters were checking blood of a wounded game and the dogs found a stag’s remains. The stag’s trophy was absolutely different looking but there was no doubt about the fact that they found Eugen’s remains. He had an accident in the velvet period when the stags grow their antlers. His head got smashed so badly, he lost almost the entire left beam, so after the accident he could grow only the remaining small piece of beam and the unharmed left brow tine. During the unknown accident his right beam was also damaged. In spite of all these things his trophy weighed 9,7kg with whole skull. Even with self- contained estimating, Eugen’s trophy weight should have achieved 15 kg without the accident. With his broken antlers probably he couldn’t fight and defend himself against other stags in the rut, so one of them could stab him to death. With his remaining power he could only go until the nearest wallowing place to cool down his wounds and that place became his final resting place. A detailed article was published about Hungarian hunting experiences of Mr. Alain Durand (Vice President of Seine- Maritime 76 Hunting Association and Deputy President of The National Hunting Association of France) in the May/June, 2013 issue of Le Magazine des Voyages de Chasse, on its page 34 & 35. The great hunting opportunities were provided by Gyulaj Hunting Hungary (Gyulaj Plc.) and Pilis Parkforest Plc. the two important players within the Hungarian state owned hunting companies. To read the French language article, please click on the pictures below! New short hunting footage from Gyulaj Hunting Hungary's YouTube channel. Now we show how the fallow buck shooting goes from a high seat. After Gyulaj's professional guide measuring the buck's age and trophy he gives the permission to take the shot. The hunting client takes the shot to the right place. The result is a beautiful trophy awarded with CIC's medal. The white buck of the footage is also more than interesting. In November 2012, the Hungarian Embassy of Paris provided place for a great hunting event organized by the Hungarian Tourism Plc. 's Paris Office and Gyulaj Forestry and Hunting Plc. During the so called "Hungarian Hunting Day in Paris" both Barbara Packi, Director of Hungarian Tourism Plc's French Office and Péter Gőbölös, CEO of Gyulaj Plc. presented a slideshow about the genaral tourism of Hungary as well as the performance of the Hungarian state owned forestries' hunting branch and sector to highlight the great results and hunting performance of the state owned hunting grounds in Hungary. To the event many hunting agencies and representatives of French hunting association and other hunting organizations were invited. Mr. László Trócsányi, Ambassador of Hungary greeted the delegation and the invited French gentlemen. By based on many personal experiences the representatives of the French hunting agencies and outfitters all agreed that the Hungarian hunting professionalism, the deep local hunting culture and the excellent habitat can provide great hunting opportunities for the French hunters. To see the slideshow in English OR French please click on the right language picture below! Gyulaj Hunting Hungary is the leading hunting company in Hungary (and Central-Europe) providing very exciting free range hunts for hunters living with disability. The special track can be easily used by wheelchair hunters even if the weather is tough. We rebuilt one of our pick up trucks for the safety off-road transportation of wheelchairs and built special shooting stands giving a perfect cover for the hunting clients. In our quality hunting lodge the renewed bathroom can be easily used with wheelchairs. 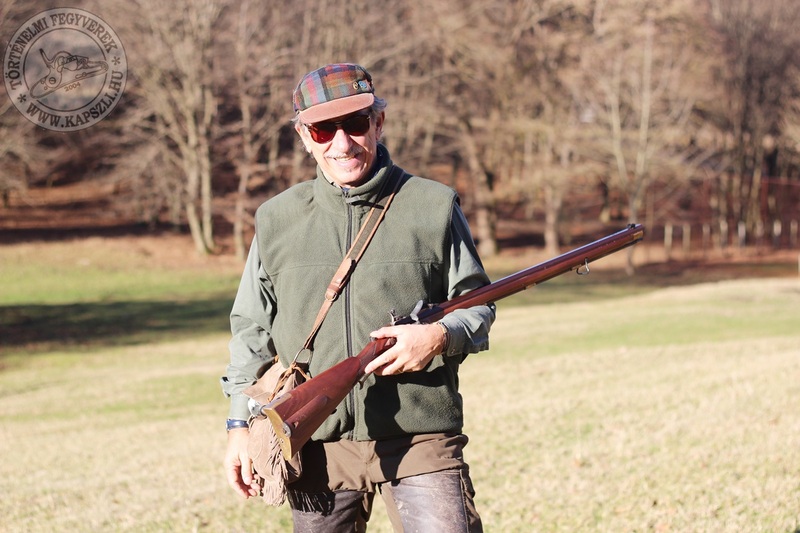 Gyulaj Hunting Hungary in Fieldsports Britain, Episode 153. "...on one of the bests hunting estates of Europe at one of the most exciting times of year..."
"...watching their (fallow bucks') wonderful behaviour in this glorious Hungarian classroom.."
"...this was the most exciting, raw, challenging hunting adventure we have ever filmed for Fieldsports Channel.."
Each year one of the most remarkable event on Gyulaj Hunting Hungary’s famous Gyulaj hunting ground is the October fallow buck rut. This splendorous time attracts many international hunters from all over the world. Roberto Civati, an Italian hunter - a returning guest of Gyulaj Plc - arrived on October 10th this year. Mr. Civati has already bagged some CIC gold medal fallow bucks with us, but this time he really desired to shoot a fallow buck with a huge trophy. On the very first stalk we were lucky to bag this great beast as this old buck had kept his well-known rutting place. In the woods he was easily recognizable by the outstanding trophy dimensions. This great buck’s trophy weight was 5,07 kg and received 207,29 CIC (International Council for Game and Wildlife Management) and 277 1/8 points (Safari Club International) on the trophy measurement. In both CIC and measuring system the magnificent trophy achieved gold medals. Right after this hunt, on next day’s evening Mr. Civati succeeded in bagging another, absolutely unique, abnormally-shaped trophy fallow buck with 2,61 kg trophy weight. By the end of his hunting trip our esteemed Italian guest was more than satisfied with this two wonderful trophies and said good bye with a certainty in his eyes that meant he will be coming back next year and will be part of the Gyulaj experience again. Gyulaj Hunting Hungary's wild boar trophy is the official No.1 on SCI 's wild boar ranklist! Finally our wild boar trophy's is the new official No.1 (world's record) trophy on SCI eurasian wild boar ranklist (rifle method). The excellent old tusker was taken by an US client in an early morning hunt in October, 2011. The great wild boar from South-West Hungary took over the 1st place of the ranklist by an impressive SCI point difference compare to the previous #1. The official score is 31 9/16 SCI by the extreme lenght of the left lower tusk which is 43.9 cm (17.3 inch). Congratulations for the American hunter again! Please check the photos in good quality of the current SCI recordbook Eurasian wild boar ranklist (rifle) by clicking on "Read more"
Gyulaj Hunting Hungary's exclusive Danish partner published an article about the new SCI No.1 (world 's record) eurasian wild boar trophy taken on Gyulaj Plc's hunting ground in one of the leading Danish hunting magazine, the BigGame. The Weatherby- award winner US client who won the auction of the "Hungarian Big Five" package during the SCI Las Vegas Convention in 2010 arrived to our South- West Hungarian hunting grounds in October, 2011. The first day early morning and evening hunt was unsuccesful but next day brought the right wild boar for the great shooter client. Both the hunter and the professional guide was impressed when they measured the tusks of the ~7 years old big game. After the raw preparation the first measuring brought even bigger surprise for both the hunter and the staff of the Gyulaj Plc. The official masurement (done by a SCI master measurer) set out the fact that by the measured SCI points this particular trophy is the new world's record of the SCI Eurasian world rank list with an impressive 31 9/16 SCI. In CIC measuring system the trophy is an abnormal trophy winning silver medal with 22,7cm and 43,9cm lower, big tusks. We hope by reading this article too, more and more hunters from Denmark will experience the excellence of Gyulaj's South-West Hungarian hunting grounds and big game populations! For reading the article in Danish language, please click on the pictures below!